Why follow? When you can lead! Arrelic Campus Ambassador Program 2018 is a platform that provides students with a range of rewards and challenges which enable campus ambassadors to gain valuable experience and develop a range of useful vocational skills including teamwork, communication skills, presentation skills and time management- employability skills which stand students in a good stead when they come to apply for graduate jobs after graduation. What Arrelic has planned for you? Transform from a college student into a professional ready to win corporate world. Get exclusive Arrelic goodies and merchandise on becoming campus ambassador. Certificate and letter of recommendation on successful completion of program. Top performers will get paid internship. Develop employability skills which stand students in a good stead when they come to apply for jobs. Can attend any paid workshop/training of Arrelic free of cost* throughout the year. Work closely with the Arrelic team to gain world class exposure. LinkedIn recommendation to all eligible candidates after completion of program. Students having strong leadership and immense love for competitive activities are most welcome to be a part of our extended family on their college/university. The candidate must be a registered candidate of a college/university. Strong interpersonal and vocational skills. A market enthusiast student with focused and career oriented. Should be proactive, creative and enthusiastic. Official ambassador and representative of Arrelic in your college/university. Coordinate the execution of activities (like seminar, workshops and training) in your college. Maintain relevant databases and submit monthly reports. Come up with innovative ideas on how we can associate with your college/university. Displaying posters on notice boards. Find out the most effective medium of communication with all students. 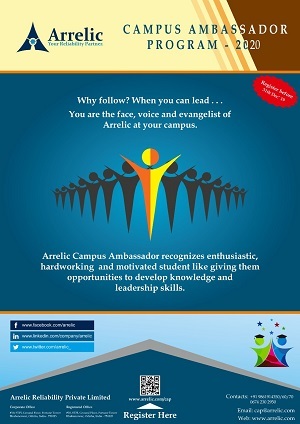 If you are interested to become a ARRELIC Campus Ambassador. We will need the following information in order to begin the application process. Click on Become Campus Ambassador button to fill details.